Cerebrospinal fluid (CSF) is a watery fluid that circulates through the brain's ventricles and around the surface of the brain and spinal cord. A CSF leak is an escape of the fluid that surrounds the brain and spinal cord. This fluid is called the cerebrospinal fluid. It results when there is a tear or hole in the membranes surrounding the brain or spinal cord. The causes for the hole or tear may include head injury and brain or sinus surgery. CSF leaks may also occur after lumbar puncture (spinal tap or spinal anesthesia). Sometimes, spontaneous CSF leaks can also occur for an unknown reason. CSF leaks can be segregated into two groups. Spontaneous leaks: occur without any known cause. Traumatic leaks: These are most commonly related to a history of head injury, surgery, or tumors. Diagnosis generally begins with physical examination and understanding your medical history. Often, the doctor will examine the nose with an endoscope. Diagnosing a CSF leak includes an analysis of the nasal fluid for a protein called beta-2 transferrin which is most only found in cerebrospinal fluid. CT and MRI scans may be required for determining the location and severity of the leakage. Pledget Study : It includes placing small cotton pads (called "pledgets") into the nose. It is used to confirm the presence of a CSF leak, although it cannot determine the exact location of the leak. Coronal CT Cisternogram : It involves using a contrast injected into the spinal fluid through a spinal tap and then performing CT scans. It is used to determine the exact location of the leak. The patient's physician also may order tests to examine the condition of the brain and spinal cord. To find out whether the hole or tear is in the cranial area or the spine, the physician may ask for imaging tests to determine the exact location of the leak. Though many CSF leaks heal on their own and require only a period of bed rest, patients with symptoms of the condition should still visit their physician because of the increased risk of meningitis. Usually, endonasal endoscopic surgery is recommended. A surgery may be necessary to repair the leak where cranial CSF leaks do not respond to conservative treatments and bed rest. If high-pressure hydrocephalus is causing the CSF leak, the condition may reoccur until shunts are used to help drain the excess fluid. Why Choose BSR Hospital for CSF Leaks? 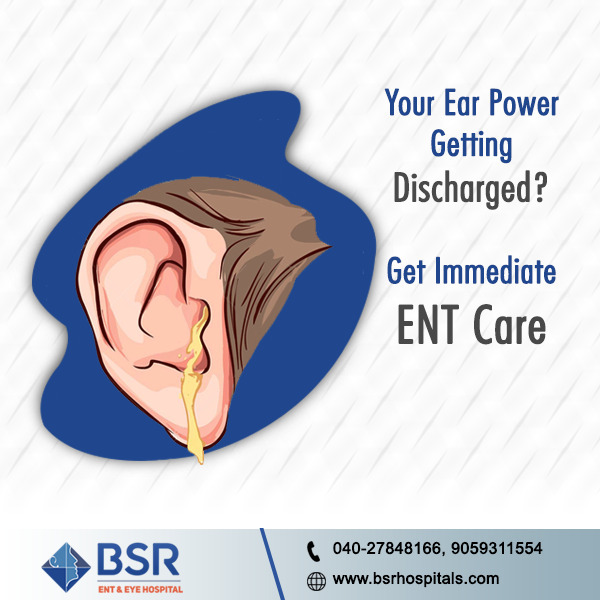 BSR ENT Hospital is one of the renowned ENT Specialist Hospitals in Hyderabad and Secunderabad with a team of expert and experienced surgeons who ensures the best quality treatment to patients. The 40+ years of experience in ENT Care, explains our expertise in our accurate diagnosis and treatment solutions we offer for various disorders and mishap conditions. Highly qualified, experienced and trained ENT specialists like Dr.B. Shanker Rao, MS, DLO, FICS and Dr.B. Kalyan Chakravarthy, MS ENT /Head and Neck Surgeon, are proficient at delivering best in treatment solutions for all ENT disorders. BSR applies latest technologies to simplify complex surgeries and provide best treatment outcomes. Our in-house Clinical and Biochemical Laboratory/Radiology help in quick diagnosis and treatment making it convenient for our patients. We at BSR hospital offer cost effective treatment for our patients with the finest quality.